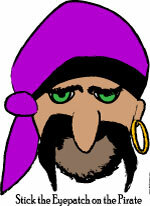 Free printable pirate iron ons to make tee shirts, flags, party treat sacks and banners. All you need is an inkjet printer, and a household iron to make these pirate iron on crafts from our free printable pirates transfers. No graphics programs required - we've already "flipped" the images so they'll print out ready for you to iron on and enjoy. Click an image to open a PDF print file of a ready-to-print iron on transfer. Use the best quality or best print color setting on your printer if your transfer paper doesn't specify a setting.